Sorry to go OT for a minute, but I just signed up for a Qobuz account (Studio tier) and it does not appear to have gapless playback (at least for me). Trying it on two iOS devices, two PCs with the desktop app, and the web player, and I get the same result - a split second or two hiccup/buffer between tracks. Doesn’t matter which quality I’ve selected. Roon does it flawlessly, and I also have no issues on the Todal desktop app. Anyone experience the same problem? Am I just missing a basic setting somewhere? Edit: I should mention that one of the PCs is outputting to monitor speakers directly through the line out, and the other via USB to a DAC. Doesn’t matter what output setting I use on the latter (e.g, wasapi, direct sound, asio). This is correct… Dont think they’ve implemented it yet. Just tested on my windows desktop app and as you say, there’s a slight gap. I reported this bug to Qobuz support a few days ago and they confirmed that the Desktop app has been completely redone and it does not do gapless (yet). They said this will be fixed in one of the next updates. Oof. Let’s hope so, deal breaker if not. Thanks for the info. Qobuz plays gapless in Bluesound also, so it’s not the source thats to blame. Neither in myVolumio or the LMS plugin. So it shouldn’t be too hard for Qobuz to fix their desktop app. 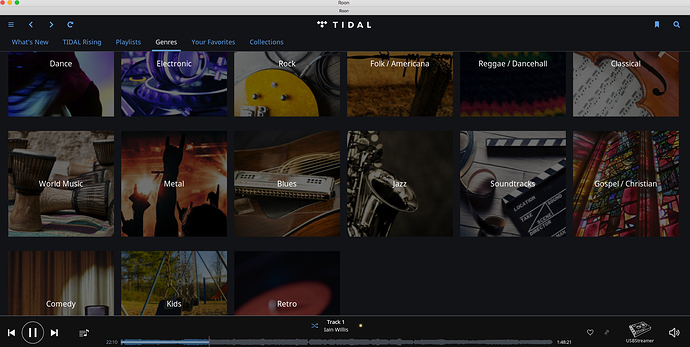 Right now the only reason I hang on to TIDAL is because it is integrated with ROON. I am currently in the assessment boat with Sublime+. Not being a lover of Hip Hop was trying to find opportunities other than Tidal. I’ve tried Qobuz with Amarra Luxe and just streaming in iOS. I can’t find the value. The hi rez was intriguing but quite frankly I prefer HDtracks and a NAS. I have a couple of weeks to go but I can’t see making the move. The real test for me would be a beta to see it work with Roon. Short of that I think I’m out too. I have 2138 Tidal albums in my library, not a single one is hip hop. Not being a lover of Hip Hop was trying to find opportunities other than Tidal. Tidal’s library is roughly joint-largest on the market at circa 59 million tracks, on par with Spotify. Interesting. I did the same experiment with my Primephonic subscription. Every album in my saved collection was also in TIDAL. I admit that surprised me. However, only one of 24-bit albums was in Master Quality in TIDAL - the rest of the 24 bit examples in Primephonic were Redbook only in TIDAL. Depends on whether you can hear the difference I suppose. I’m a Qobuz beta tester and I can say that to my ears, the Hi-Res streaming files sound more ‘organic’ than the same streaming files played via Tidal and MQA. Having said that though, if given a choice between Tidal with Roon and Qobuz without it, I’d chose to keep Tidal with Roon. My question is; how will we be notified when we’re able to use Roon with Qobuz? Because when that day arrives, I’ll be dropping Tidal and switching over to Qobuz. If and when they release an update it would be announced here and likely a press release to follow.